“We believe that in addition to a Planet Nine, there could also be a Planet Ten, and even more,” say two Spanish astronomers, the brothers Carlos and Raúl de la Fuente Marcos, who together with Sverre J. Aarseth from the Institute of Astronomy of the University of Cambridge (United Kingdom), developed statistical and numerical evidence leads them to suggest that there is not just one planet, but rather several more beyond Pluto. In the race towards the discovery of a ninth planet in our solar system, scientists from around the world have strived to calculate its orbit using the tracks left by the small bodies that move well beyond Neptune. Now, the astronomers from Spain and Cambridge University have confirmed, with new calculations, that the orbits of the six extreme trans-Neptunian objects that served as a reference to announce the existence of Planet Nine are not as stable as it was thought. At the beginning of this year, the astronomers K. Batygin and M. Brown from the California Institute of Technology (Caltech, USA) announced that they had found evidence of the existence of a giant planet with a mass ten times larger than Earth’s in the confines of the Solar System. Moving in an unusually elongated orbit, the mysterious planet will take between 10,000 and 20,000 years to complete one revolution around the Sun. Now, however, the brothers de la Fuente Marcos, and Sverre J. Aarseth have considered the question the other way around: How would the orbits of these six ETNOs evolve if a Planet Nine such as the one proposed by K. Batygin and M. Brown really did exist? The answer to this important question has been published in the journal Monthly Notices of the Royal Astronomical Society (MNRAS). “With the orbit indicated by the Caltech astronomers for Planet Nine, our calculations show that the six ETNOs, which they consider to be the Rosetta Stone in the solution to this mystery, would move in lengthy, unstable orbits,” warns Carlos de la Fuente Marcos. According to this new study, also based on numerical (N-body) simulations, the orbit of the new planet proposed by Batygin and Brown would have to be modified slightly so that the orbits of the six ETNOs analysed would be really stable for a long time. These results also lead to a new question: Are the ETNOs a transient and unstable population or, on the contrary, are they permanent and stable? The fact that these objects behave in one way or another affects the evolution of their orbits and also the numerical modelling. “If the ETNOs are transient, they are being continuously ejected and must have a stable source located beyond 1,000 astronomical units (in the Oort cloud) where they come from”, notes Carlos de la Fuente Marcos. “But if they are stable in the long term, then there could be many in similar orbits although we have not observed them yet”. In any case, the statistical and numerical evidence obtained by the authors, both through this and previous work, leads them to suggest that the most stable scenario is one in which there is not just one planet, but rather several more beyond Pluto, in mutual resonance, which best explains the results. “That is to say we believe that in addition to a Planet Nine, there could also be a Planet Ten and even more,” the Spanish astronomer points out. These studies are only a few of the countless international peer-reviewed articles published or in preparation about the search for Planet Nine with the help of N-body simulations and other techniques. Batygin and Brown are going to present soon new models of the orbit of the mysterious Planet Nine with up-to-date data. 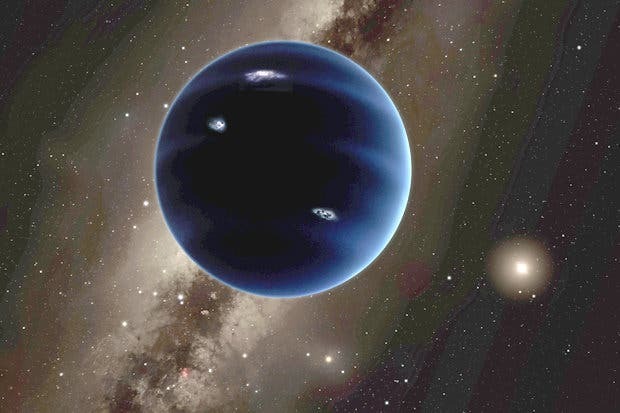 On the other side of the Atlantic, in France, Professor Jacques Laskar’s team from the Paris Observatory is also attempting to be the first to compute the position of the hypothetical Planet Nine in order to then observe it. This situation is reminiscent of the discovery of Neptune, in which the French mathematician Urbain Le Verrier was the first to “discover” a new planet using laborious hand calculations based on the positions of Uranus; later, the German astronomer J. G Galle directly observed it. “If Neptune was the first planet discovered using pen and paper, Planet Nine could be the first to be discovered using entirely computerized numerical calculations.” notes de la Fuente Marcos, although he points out that the results of the French team are based on residuals in the tracking data from the Cassini spacecraft, in orbit around Saturn, caused by the presence of the hypothetical planet, but NASA has denied it, suggesting that it could simply be statistical noise in the signal. One of the most revolutionary studies from recent months, also with computational simulations and participation of French institutions, was led by the researcher Alexander Mustill from Lund University (Sweden), who raised the idea that Planet Nine may have come from outside the Solar System, that is to say, that it could be an exoplanet. His hypothesis is that around 4.5 billion years ago, our then young Sun “stole” this planet from a neighbouring star with the help of a series of favourable conditions (proximity of stars within a star cluster, a planet in a wide and elongated orbit,…). Other scientists, however, believe that this scenario is improbable. The debate is on. What all astronomers do agree on is the importance of closely tracking the motions of the extreme trans-Neptunian objects to be able to adjust the calculations that should lead the way to the location of Planet Nine, without forgetting that the best evidence will be its direct observation, a race which several research teams are fighting to win. 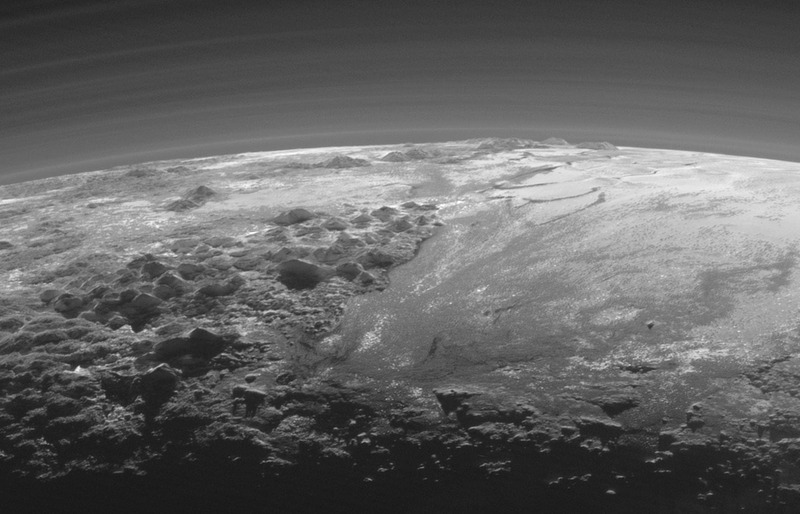 The NASA New Horizons near-sunset image at the top of the page shows Pluto’s Norgay Montes (left-foreground), Hillary Montes (left-skyline), and Sputnik Planum (right).